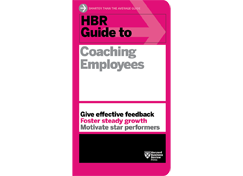 This resource offers solid reminders of best coaching practices as well as insightful comments to enhance your coaching abilities. Each chapter, written by different leadership experts, provides learnings and take-aways for you to adapt your own coaching approach. The introduction, for example, emphasizes there is not one “Right” coaching style and encourages leaders to practice different techniques to best support coaching team members for success.